Visiting author Brie Arthur talked about her unique approach to pairing edibles with ornamental landscapes and her book, The Foodscape Revolution. She sold out a case full of her books and autographed them, having a lengthy personal chat with each HUGger. And it really is a good book and it was a great talk. Brie’s approach is aimed at fitting edibles into an HOA-tolerated suburban landscapes, usually large sprawling landscapes, but there is plenty in the book to use for smaller urban spaces provided you have the sun. You start with a landscape plan of ornamental perennials, shrubs, trees, flowers–your ornamental framework. The book has a chapter on planning your landscape and suggestions for plants including some natives and even some edibles. Many edibles are beautiful plants such as citrus and other fruit trees, beauty berry bushes… What else is good for our climate? Her first, and simplest, tips is to plant edibles along the edges of your beds where not only can they make attractive borders, they are easy to plant and harvest. Examples include garlic, which has the added benefit of repelling some pests from your beds, greens, potatoes, peppers, peanuts, basil etc. Switch with the seasons by doing garlic or onions, lettuces, winter herbs or potatoes in cool season. Peanuts, peppers, bush beans, basil, etc for warm season. Brie names some shrubs that she says can support a tomato growing through it practically invisibly. A photo on page 48 ofThe Foodscape Revolution illustrates this with tomatoes, but little tomato foliage visible, apparently supported by a hydrangea. In addition to the tomatoes, vine plants are obvious selections with peas in winter and pole beans in summer. These have the benefit of being attractive vines as well. Brie names spires (Virginia Sweet Spire?) hydrangea, viburnum & lilac. Although we don’t do lilacs here. Perhaps we can compile our own list, ideally from native plants. Another concept is to divide up your landscape into zones radiating out from the house. The idea is to put mostly ornamentals near the street where they won’t upset the HOA and most edibles near the house where you have quick access, can give them more care, and where they are less visable. Also, near the home, they can be used to define your outdoor living spaces into “rooms” with vertical structures and planters. Brie also touched on growing grains in place of, or with ornamental grasses. You can even do it in pots. Buckwheat is an obvious good choice as it benefits your soil. There’s a reason it’s so often used as a cover crop. It’s germinates easily and has pretty white tufts of flowers. She recommended everyone try growing an ornamental variety of rice with purple or yellow foliage. Look for upland varieties. These do not require a great deal of water. Flooding fields was a weed suprression method and flood tolerant varieties were developed to survive this. Rice has an extended seed production period, so you can harvest Brie grows Sorghum and makes her own sweetener! One chapter of the book is devoted to grains with varieties and techniques for planting, harvesting and threshing your home crop. I’m particularly interested in Sesame, which she says has lovely velvety green foliage and white foxglove-like flowers all summer long. One summer several years ago, Bob Randall was our speaker on the topic of “what to plant now” and he mentioned sesame as a good thing we could plant even in July. He didn’t that it was beautiful. (Sesame is also the main source for a phytonutrient called sesamin which has some potent anti-aging benefits.) Brie recommends you sow grains in open trays, rather than sells, then you can transplant to your beds or pots in clumps. 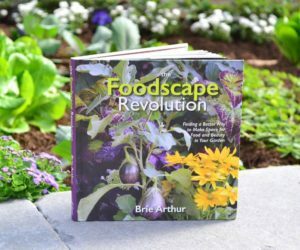 The rest of the book is devoted to preparing & caring beds, crop selections, alternative growing systems such as hydroponics, harvesting preserving and preparing, including recipes. There’s a section to help you select edibles based on your favorite ornamentals. You can substitute or mix grains with ornamental grasses, amaranth with coleaus or other colorful foliage plant And there are a few other landscaping concepts such as the edible meadow in one section of her lawn and the edible neigborhood entryway. You know-that signage, usually on some low brick wall with the name of your planned community, that’s surrounded by seasonal color. Why not make it a community garden?